Michigan is often considered a great place for bicyclists, with great trails located all across the state. In the midst of all this, though, many wonder where exactly a good place to get bikes in Michigan is. The good news is that, with all that biking, there are plenty of bike shops on hand too. So for those who need a set of wheels or biking-related gear, check out these 10 great shops in the state! Regarded as one of Kalamazoo's best bicycle shops, Pedal Bicycles offers an array of bikes, as well as parts, accessories and clothing, allowing cyclists access to the fullest range of possibilities. There are even several specific items for the ladies. Beyond that, though, Pedal Bicycles offers service for broken bikes, special events for cyclists to enjoy, and even a blog full of information and perspective. That's about as full-service as it gets. Mackinac Island is a major proposition for bikes, especially given that engine vehicles are very sharply curtailed on the island. This makes bikes the primary way for regular visitors to get around, and makes a bike shop downright indispensable. Mackinac Bike Barn on Mackinac Island offers bikes for sale and rent, along with an assortment of accessories. Repair and parts services are also on hand, making this a nicely extensive operation for those who want to tour Mackinac on the primary tourist travel system. It's no surprise that Traverse City has a presence in bicycling, but that's the story with Brick Wheels, home to one of Traverse City's leading bicycle shops. Of course, it features the usual suspects in bikes and repair services, as would be expected. However, Brick Wheels also boasts something unusual: A line of electric bikes that allow a bike to be driven by something a little more than human leg power. That's a clever development, especially for those who want their bike rides to go a little farther than their endurance will allow. The top listing on the 2015 Detroit CityVoter rankings, Hometown Bicycles in Brighton will deliver a top-notch bicycle experience. The company is eager to build the perfect bike, a goal even it regards as impossible, but one it pushes toward regardless. Hometown Bicycles has repaired over 2,000 bikes annually for the last three years, a figure which shows cyclists are more than willing to count on the Hometown crew when it comes to getting repairs made. If there's one thing a beach town has to know, it's bicycles. Beaches and bikes go together like hand in glove, and Rock N Road Cycle will be a big help getting cyclists matched with bikes. Featuring bikes for sale and rent, along with a set of repair services, the complete picture is right here. Plus, Rock N Road Cycle even sponsors some events geared toward getting people on bikes, like its Boo On Your Bike event around Halloween every year that covers six miles, offers a view of plenty of Halloween-related sights, and even free refreshments. If a bike ride through the tulip fields of Holland sounds like a great idea, consider checking in with Velo City Cycles, a bike shop that handles most of the traditional needs. Bikes for sale and rent are on hand, including a specific slate for the kids. Repair services are also in, as well as bike fitting sessions—just to make sure you're riding the right bike for you—as well as the PetalCab Bike Taxi system. PetalCab is a pedicab system that functions much the same way a taxi does, but with bicycles, allowing users to see Holland by bicycle, but without all the pedaling. With locations in Fulton, Ada and East Paris, Grand Rapids Bicycle Company is big enough to meet needs, but small enough to care fully about the customer. Featuring a full array of bikes and accompany merchandise from makers like Cannondale and Sugoi, Grand Rapids Bicycle Company has not only everything you'd like to buy permanently, but also rent. A company newsletter helps keep track of bicycle events in the area, and those on a tighter budget may want to check out the clearance section for all the latest in bicycle fun at a good price. The oldest bike shop in Marquette, and not far from Northern Michigan University, Marquette's Quick Stop Bike Shop is out to be a standard bearer in Upper Peninsula biking. Closed Sundays—they're out riding that day, you understand—Quick Stop offers sales, service and rental options, but also provides a wealth of information on where to bike in the area, as well as hotel information and even a section about where to eat and grab a drink following a good bike ride in the area. Called the finest bike shop in the Tri-Cities area of Midland, Bay City and Saginaw, and home to the “largest fat bike inventory in Central Michigan,” Ray's Bike Shop has no shortage of offerings for cyclists to take advantage of. 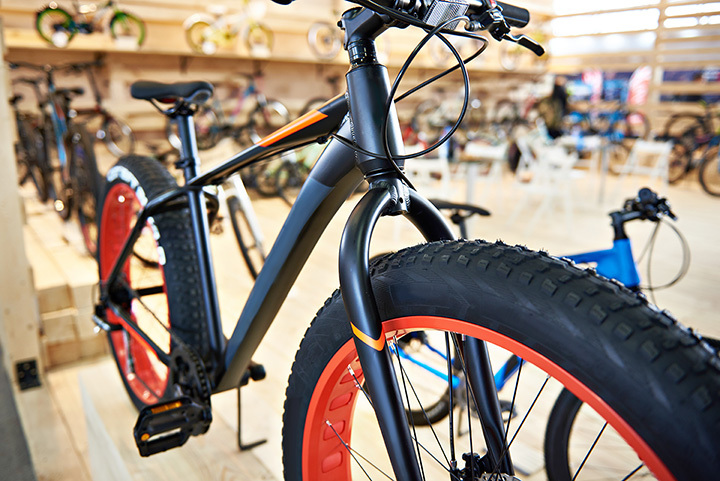 With locations in Midland, Bay City and Clare, Ray's can not only offer its shoppers access to bikes and relevant accessories, but also bike-related clothing including an array of winter biking clothes, perfect for riding those fat bikes. Don't forget to check out the rental options, along with a listing of where to bike in the Tri-Cities area. It won't surprise anyone that Ann Arbor has one of Michigan's truly great bike shops on hand, and it shows in not only its range of offerings but also its delivery of these services. It's got bikes, of course, from BMC to Focus, but it's also got a repair base skilled enough to handle everything from minor fixes to a complete overhaul. It's even set up for certain custom jobs, meaning that you might have the bicycle you always wanted, even if you can't find it in stores.